Quality for Tiemme means quality products and processes together with environmental sustainability. These are all details which have allowed the company to certify its products and systems. Tiemme’s love for its own products has always meant respect for the environment, intended as the human and natural landscapes. 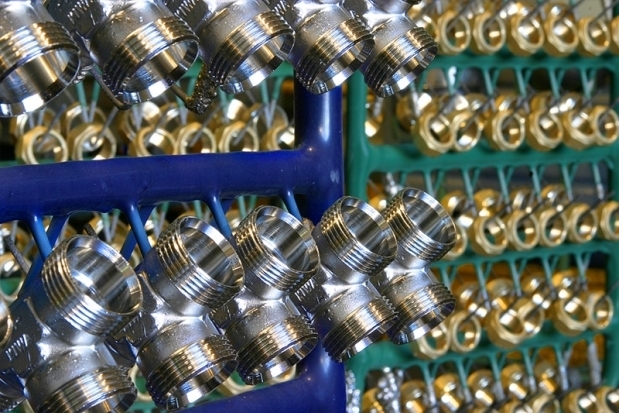 In this way, Tiemme is an example of an eco-sustainable industry and has contributed to turning the brass component production into a closed cycle production. In fact, during the entire production process – from the first machining phases up to the final product – Tiemme has developed a system for the collection and reuse of production scraps, machining waste waters and the raw materials contained in them, and heat generated during some of the phases. An ecologic quality of the entire industrial cycle that limits consumption of natural resources and reduces environmental impact thanks to controlled waste management, optimisation of energy consumptions and reuse of industrial waters. The safety of personnel working in the facilities is an absolute priority for Tiemme and it regularly checks safety levels, hygiene and health in the workplace, and makes the technical and organisational changes deemed necessary. In addition Tiemme offers its workers continuous training, information and refresher programmes to guarantee respect of the established safety and environmental standards. Tiemme was one of the first companies operating in the field to obtain as far back as 1999 the ISO 9001 quality certification for design and development of its products, production processes and services offered to its customers. Tiemme Raccorderie’s quality management system is certified as stemming from its excellent organisation and production levels, for long pursued by the company. More in detail, Tiemme’s wide range of products are checked and certified by the most renowned international certification bodies. This is an essential element for the Company’s international brand awareness. A modern and efficient assistance department, composed of competent technicians, is actually necessary for the management of the over 120 certificates, presently referring to the products and systems of the Tiemme Raccorderie range.